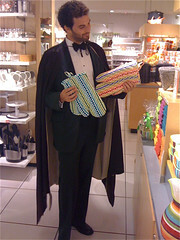 How to choose an oven mitt, while being dressed magnificently. Step 3: Cape. Find a costume shop going out of business and buy a phenomenal, satin, deep purple cape, which makes you feel like a count or some other royalty that spends his days sleeping and his nights agonizing over oven mitts at Crate & Barrel. Step 4: Go to Crate & Barrel, which has a nice selection of oven mitts.